Hong Kong’s iconic skyline and waterfront has largely remained untouched over the years, but that’s all set to change with the introduction of the much-awaited museum M+ and Rosewood Hong Kong, the brand’s first property in their headquarters and an anchor of Victoria Dockside, an arts, design and conceptual retail district. Once Rosewood Hong Kong opens its doors on March 17, the imposing 65-storey harbourside hotel designed by Kohn Pedersen Fox Associates is sure to stand out. Out of the 322 guestrooms and 91 suites—80 per cent of which will enjoy harbour views—their signature suites are the ones to book. Located on the 57th floor, the 1,000-sqm Harbour House and The Garden House feature a private terrace with wraparound views of Victoria Harbour, private gardens, lap pools and sun decks and even a dedicated private gym. The Highlight: This property is also the first to house Asaya, Rosewood's “integrative wellness offering”, in a city setting. Spanning two floors, it promotes self-change and transformation and is the perfect oasis to escape from Hong Kong's frenetic pace. Hot on the heels of the successful launch of Waldorf Astoria Bangkok, the brand’s first property in Southeast Asia, Hilton Hotels’ luxury portfolio is strengthening its presence in the Maldives. Sister brand Conrad Maldives Rangali Island recently unveiled The Muraka, the world’s first underwater villa, and up next is the exquisite Waldorf Astoria Ithaafushi. Set on three islands in South Male, the hotel has 138 beach and overwater villas ranging from one to four bedrooms making it great for any type of trip—be it a honeymoon or a family holiday. The best part? It's only a 20-minute boat ride from Male's international airport, ensuring that you maximise your time in paradise even if all you have is a long weekend. The Highlight: Splurge on Ithaafushi Island, the resort’s private island accessible only by yacht. With a three-bedroom beach villa, two-bedroom overwater villa, a multitude of pools and dedicated staff, it's just the place you'd like to get stuck in. The next time you’re luxuriating in the Namib Desert, take a minute to thank Angelina Jolie. Impressed by Phum Baitang, Zannier Hotel’s property in Cambodia, she clued in founder Arnaud Zannier to Namibia’s allure and the rest, you can say, is history. In 2018, Zannier Hotels opened their first camp Omaanda (as well as a Zannier Reserve); it will soon welcome guests to its second lodge, Sonop. 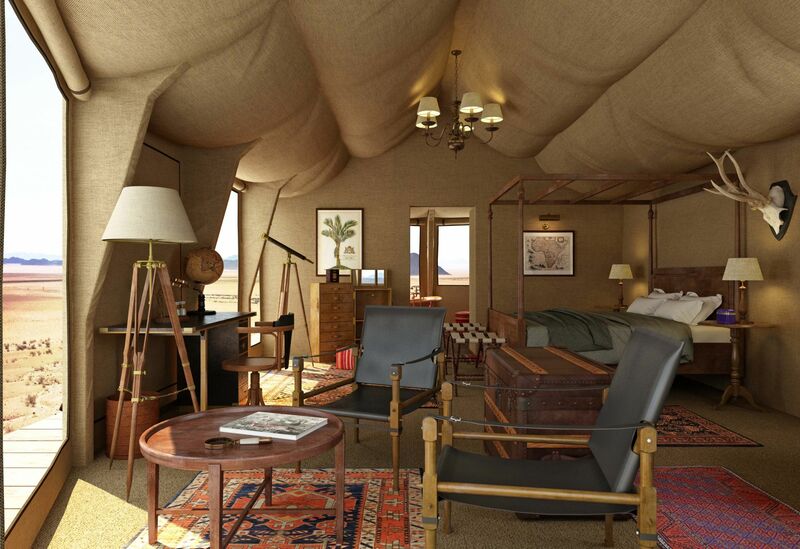 Located in Namibia’s Karas region, the luxury camp sits atop boulders with ten tents designed in British colonial style. Here, you’ll be surrounded by emptiness of the Namib Desert but enveloped in complete sophistication. Land in the private airstrip, enjoy white-gloved gastronomic delights then top it off with a dip in the infinity pool or a treatment at their in-house spa. The Highlight: Expect equal parts exploration and isolation at Sonop. Take in the otherworldly dunes and wildlife from the sky via a hot air balloon excursion or on the ground via horseback. This year, there are a number of heritage hotels reopening following extensive refurbishment such as our very own Raffles Singapore and the equally iconic Belmond Cadogan Hotel London. Originally The Cadogan, the 130-year-old hotel has a colourful history (Oscar Wilde famously awaited his arrest here, for instance) and is set to begin a new chapter under the Belmond brand. Situated between Knightsbrige and Chelsea, the Georgian-style hotel is the ideal base to explore London’s cultural gems and shopping highlights; its new residential-style interiors are designed to make guests feel truly at home. And with the recent announcement of Belmond’s acquisition by luxury conglomerate LVMH, one can only expect an even more exceptional experience. The Highlight: Every Belmond endeavour is sure to have a solid culinary offering. Next time you're in London, reserve at table at flagship restaurant Adam Handling, Chelsea, which will serve modern British fare highlighting seasonality and sustainability. Twenty years after entering the scene, Ace Hotel has finally landed in the destination of their dreams—Japan. A favourite of creative nomads the world over, Ace has revolutionised the hospitality industry by democratising design, championing local brands, as well as crafting multipurpose spaces. Case in point: They pioneered lobbies that double as co-working spaces in Ace New York, something that has become the norm. Later this year, Ace is bringing its brand of cool to the beautiful, historic city of Kyoto. A partnership with NTT Urban Development Corporation, the hotel will be housed in the former Kyoto Central Telephone Office built in the 1920s by Tetsuro Yoshida. Renowned Japanese architect Kengo Kuma, who is also behind the Tokyo 2020 Olympic Stadium, is tasked to meld the old and the new in this landmark conversion project. The Highlight: Ace Hotel Kyoto makes up one part of the redevelopment of ShinPuhKan, so there’s surely lots to discover within the building and the neighbourhood to delight the culturally curious local and foreign visitors. Home to some of the world’s best restaurants and winemakers, Napa Valley is a culinary destination known the world over. Now, discerning gastronomes have another luxurious place to stay—the Four Seasons Napa Valley, located in the northern town of Calistoga. Spanning 2.3 hectares, the property features 85 rooms designed in farmhouse style, a winery run by Thomas Rivers Brown, as well as stylish restaurants and a General Store that celebrate local bounty. Wine, of course, is central to the experience of every guest. “The grape-to glass experience is part of every stay,” promises general manager Mehdi Eftekari. The Highlight: This wine hotel isn’t just for savouring Napa’s best Cabernet Sauvignon, but is positioned as a relaxing destination for the entire family. There’s a spacious spa with 8 treatment rooms, two outdoor pools (one reserved for families), and a “Kids For All Seasons” programme. The modern Mandarin Oriental Wangfujing marks the brand’s debut in the Chinese capital. Located just a 15-minute stroll from the Forbidden City, the hotel also benefits from being located within the upscale shopping district of Wangfujing. Occupying the two top floors of lifestyle retail destination WF CENTRAL, the 73-room boutique hotel also features a 25m lap pool with sky roof. Key historical sites including Tiananmen Square, the National Museum, and the National Art Museum of China are all walking distance, and so are the charming hutongs (alleyways) of Beijing. The Highlight: With entry-level rooms measuring 55sqm, the hotel promises the most spacious accomodation in the capital. Many of the rooms enjoy a view of the Forbidden City (the Mandarin Room has a panoramic one) and come with amenities including Dyson hairdryers and Diptyque toiletries. After opening in Bhutan and completing their first city hotel in Singapore, Six Senses continues its string of noteworthy openings in 2019. This time, they're venturing to mystical Rajasthan to refurbish the 700-year-old Fort Bawara, a historical structure owned by the Rajasthani Royal Family. The sensitive conversion project aims to protect the original fort structure while adapting it to modern needs. Sitting on 2.2 hectares of land, the hotel will feature 48 suites, 2 restaurants, a bar and lounge, and a Six Senses Spa. The latter is to be housed in the original women’s palace and will offer comprehensive Ayurveda treatments alongside the brand’s myriad wellness programmes. The Highlight: Guests craving for a nature adventure can avail of the daily safari drives at the nearby Ranthambore National Park. Just 30 minutes away from the property, the sanctuary is home to a formidable tiger population, leopards, sloth bears, and other wildlife. In harmony with the pristine surroundings of Pokhara Valley, The Pavilions Lake View Himalayas follows in the green footsteps of its award-winning sister property, The Pavilions Himalayas. Getting to the resort is an experience in itself—one must take a paddle boat across Phewa Lake, the second largest lake in Nepal and ground zero for all of the attractions in the valley. Featuring 8 luxury tented eco villas, a first in the country, The Pavilions proffers a true nature immersion given the tents’ open design. Backed by the Himalayan mountain range and surrounded by serene rice fields, they're built so guests can savour the fresh air and take in the clear, star-studded sky come nightfall. The Highlight: While it’s perfectly acceptable to laze in your tent, make the most out of the majestic surrounds by mountain trekking, kayaking on the lake or joining a guided walk led by a local naturalist. For more information, visit The Pavilions Hotel Himalayas. A high thread count and large square footage used to be the measure of a standout hotel. Today, distinctive interiors and a strong point of view matter much more. This is what British hospitality brand The Hoxton trades in, and their "individual, open-house hotels" are as much as a hit stateside as they are in Europe. The Hoxton, Downtown LA is their fourth hotel in the US, and they've again found a soulful building and creative neighbourhood to stake their claim. Housed in a 10-storey Broadway building that was formerly the headquarters of the LA Railway Authority, each of the 174 rooms has been transformed by Ennismore Design Studio, and now features chevron timber floors, on-trend metallic accents, and details inspired by the building's Beaux Arts architecture. The Highlight: Communal, buzzy dining outlets are part and parcel of every Hoxton hotel. Get the pulse of downtown Los Angeles at the all-day dining restaurant on the ground floor, the basement bar or at the stylish rooftop pool and bar. Just a short drive from Singapore and within Malaysia's state of Johor is Desaru Coast—the chosen location for One & Only Hotel and Resort's first-ever property in Southeast Asia. Designed by esteemed practice Kerry Hill Architects, One & Only Desaru Coast is an ultra-luxury resort that promises utmost privacy without the pretension. Part resort, part residential paradise, the beachfront development spans 128 acres and features 42 hotel suites as well as around 50 private homes for sale. Complementing the streamlined tropical design are amenities such as a sweeping destination spa and an enticing beach club. The Highlight: Beach lovers aren’t the only ones catered to here. The hotel is located close to Els Club Desaru Coast, a prestigious golf club that features the Ocean Course, a 27-hole layout designed by golf champion Ernie Els. For more information, visit One & Only Hotels and Resorts. There’s nothing like a good comeback story and the return of the Orient Express brand, 136 years after it took its maiden voyage from Paris, is one for the books. Housed in King Power Mahanakhon Tower—which, at 78 stories high is currently the tallest building in Bangkok—sets the stage for the brand's grand entrance. In contrast to architect Ole Scheeren’s avant-garde architecture, designer Tristan Auer will bring the old-world Art Deco and botanical motifs of the Orient Express carriages into the 154-room property. The city hotel also set aside an entire floor for its wellness initiatives, with amenities including an outdoor pool and jacuzzi as well as the Orient Express Spa by Guerlain. The Highlight: Design enthusiasts aside, food lovers will also be spoilt for choice. The hotel will launch two signature restaurants—Hong Kong export Mott 32, which will serve Cantonese fare, and Mahanathi by acclaimed chef David Thompson. For more information, visit Accor Hotels.